It doesn't take a backbone to be a genius — or a master of the comedic arts, apparently. 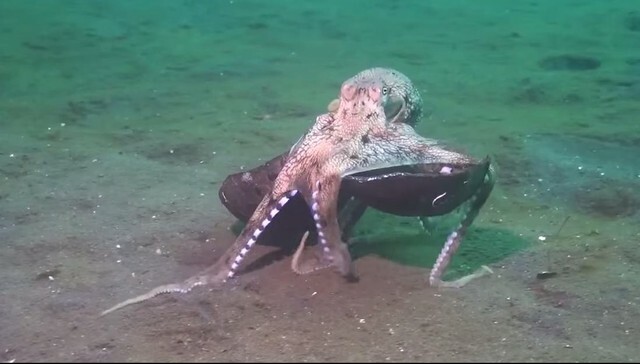 An octopus has been captured on film exhibiting one of the most remarkable (and amusing) examples of tool usage in the animal kingdom. Footage shows the eight-limbed animal literally walking along the ocean floor carrying two halves of a broken coconut shell beneath his arms, seemingly without rhyme or reason. But this tentacled one knows exactly what he's doing. As it turns out, some octopuses, like this, one possess the foresight to actually pack along coconut shells to use as protective shelters when exploring areas without adequate places to hide. Scientists say this behavior is the first evidence of tool use by an octopus, putting the aquatic animals in a league with a small number of other animals known to do the same. Interestingly, this incredible finding was nearly lost to science within moments after being discovered. Julian Finn, a researcher from the Victoria Museum in Australia, who was among the first scientists to have witnessed this behavior first hand, was so impressed by what he observed — it nearly killed him. "I almost drowned laughing when I saw this the first time," Finn told the BBC. "I could tell it was going to do something, but I didn't expect this — I didn't expect it would pick up the shell and run away with it." Responses to "Incredible Octopus Behavior Nearly Caused Scientist To Drown From Laughing "
Someone showed it some Monty Python, obviously. Is that a European octopus, or an African octopus? What does he mean: Pic up the shell? Most belong to the dear one! Can any tell, please? Too bad he couldn't close it right over himself. On the tv, they showed them going from tank to tank to eat other fish and then going back before people came into the room. Smart.